A kid of any age will love these nuggets! They are crispy on the outside and moist and tender on the inside. I like using frozen chicken breast tenderloins, because they are handy to keep in the freezer and quick to thaw. This yummy recipe comes from Martha Stewart’s Everyday Food, April 2012. Preheat oven to 400 degrees. Cut chicken into 2-inch pieces. On a rimmed baking sheet, spread panko crumbs and bake for about 6 minutes or until golden brown. Place crumbs in a shallow dish, add Parmesan cheese and 1/2 teaspoon salt. Drizzle I tablespoon oil over crumbs and mix well. Increase oven temperature to 450 degrees. Place flour and eggs in shallow dishes. Put a little oil on a paper towel and rub on the baking rack. Place it on top of baking sheet. 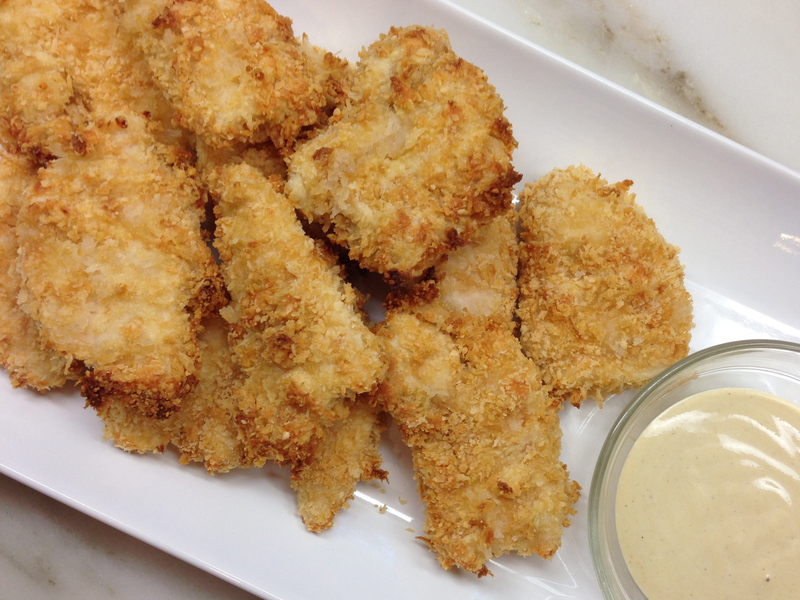 Taking several pieces of chicken at a time, coat in flour, then dip in egg, and finally cover with the panko crumbs. Place them on the rack. Place chicken in the oven and bake for 6 minutes. Then flip them over and bake for another 6 minutes or until the nuggets are golden brown and cooked through. Serves 4. Blogger’s note: I made a little dipping sauce using equal amounts of yellow mustard and mayo. Click on link below for Martha’s dipping sauces. I apologize for not responding to your comment sooner. Unfortunately, it was put in my Spam file. Thank you for your kind words. I really appreciate it!